Spinning out of the events of INFINITY WARS comes an epic space opera from DEADPOOL veterans Cullen Bunn and Matteo Lolli! Angela, the not-so-beloved half-sister of Thor. The hotheaded Valkyrie - and the human who shares her form, Annabelle Riggs. Skurge the Executioner, freshly returned from Hel. Throg, the mightiest frog of thunder. Kevin Masterson, the boy who took his father's mace to become the hero Thunderstrike. And the Destroyer, the Asgardian armor built to take down Celestials - its wielder unknown. 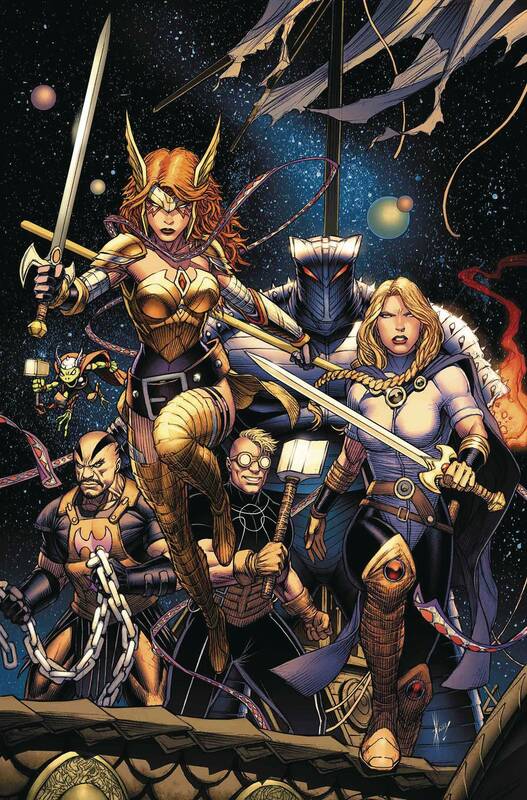 The events of INFINITY WARS set NEBULA off on a quest to rule the galaxy - wielding an Asgardian weapon even Thor would fear - and it's up to this team of gods, assassins, frogs and heroes to stop her. Rated T+.